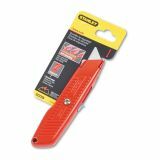 Stanley Interlock Safety Utility Knife w/Self-Retracting Round Point Blade, Red Orange - Spring-loaded utility knife retracts safely when pressure on button is removed. It is great for cartons. Patented, internal interlocking design secures blade in place for added safety. 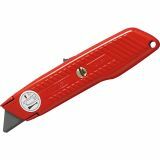 Knife uses round-point blades that reduce risk of accidents and damaged products. 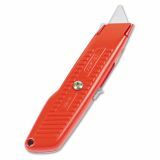 Orange color offers easy visibility, Knife includes one round-point, utility knife blade (11-987).